Abstract: Nowadays, more and more people have their own cars and choose to drive to work. However, traffic jam also becomes common in big cities. Airwheel intelligent electric bike allow daily commuters to easily get around even in the most crowded street. With the quick pace of the current society, many people are on the way of pursuing faster speed. But is driving really the fastest way of traveling in city streets? Sometimes may not when facing traffic jams and finding parking area is another big problem! It is important to find a better means of transportation which is more convenient than driving cars in urban area. Airwheel R6 Smart electric bike allows riders to forget the worry about traffic jam and parking problem. Airwheel R6 smart electric assist bike is coupled with branded battery which helps achieve long range to meet the daily commute needs. The electric assist bike has three ride modes: bicycle mode, moped mode and electromobile mode. The bicycle mode which is fully man-powered is a green and great way to work out. 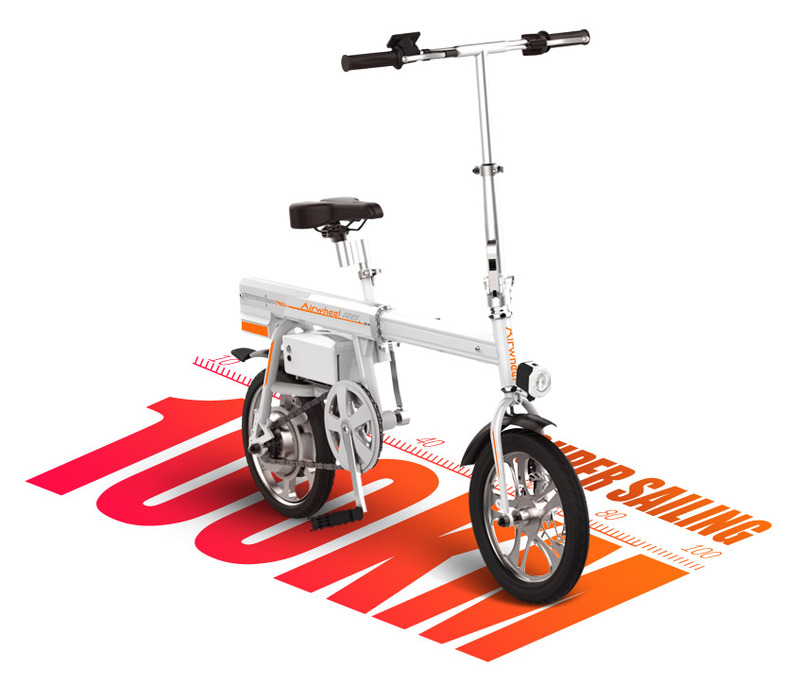 The moped mode has 11 gears available combing different levels of man power and electricity power, which enables riders to save energy as well as do exercise. When in electromobile mode, Airwheel R6 is powered by battery only, letting you enjoy the high speed of 20km/h! Inheriting the humanized designs from R5, Airwheel R6 smart electric assist bicycle stands out for its unique features, like the automatic folding system which allows riders to press one button to extend or contract automatically. After folding, the mini body can be carried around easily. It can be carried into office as the folding volume is only 0.27 m³. Besides, when it's raining, people can easily carry it into subway, bus or store it in the car trunk. The portable design perfectly solves the problem of parking. Innovative design shines in every detail. Considering the charging needs of different using environment, Airwheel R6 smart e-bike has two ways of charging. You can either charge directly or remove the battery to charge (even charge in the car with additional adaptor). What's more? When in emergency, the battery can be used as a power bank for smartphone because it has built-in USB port! Isn't it an attractive feature for daily commuters?